Technophone was a company set up in 1984 by Nils Martensson, a Swedish radio engineer who left Ericsson to set up on his own in 1978. Nils Martensson’s dream was to transform the large, clunky”brick” into the world’s first mobile phone to fit into the pocket. 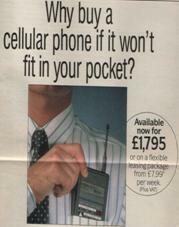 He secured a DTI R&D grant, brought as much computer technology into the mobile phone as the state of the art would allow (including soft keys) and the PC105T arrived on the market in 1986 with a price tag of £1990. The technical challenges were enormous and during the development phase Nils incentivise his development engineers to reduce the power drain with a cash bonus for every mille-amp of current reduction they managed to achieve. Bit by bit the technical issues were resolved and the phone sold through Excell Communications as the Excell M1 (an example is in the New Information Age Gallery of the Science Museum in London).and then the M2 that went on to sell in large numbers. (iii) By 1991 Technophone was Europe’s second largest mobile phone manufacturer by handset volume after Nokia. In that year it was bought by Nokia… positioning Nokia as the Number 2 mobile supplier in the world after Motorola…and well positioned for greater things.